Palm tree and your choice of words embroidered cotton beach bag. 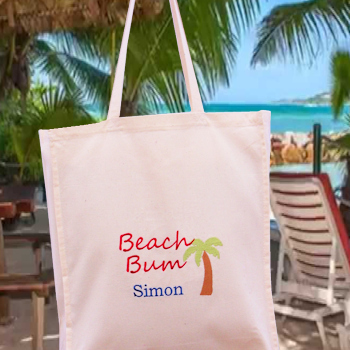 Palm tree and your choice of words embroidered cotton beach bag. Great size to hold the towel, sun block, glasses and book. Sturdy over the shoulder length handles. Palm tree and your choice of words embroidered cotton beach bag. Great size to hold the towel, sun block, glasses and book. Sturdy over the shoulder length handles. Exclusively designed by Amys Gifts, not available on the High Street. Personalised with a name or nickname of your choice!